I was in Canada on a skiing holiday when I heard the news that Michael Schumacher had been seriously injured in a skiing accident. My first reaction…’was he wearing a helmet?’ I was revealed to hear he was wearing a helmet and that this reduced the severity of his injury. I have skied since I was nine years old and in Vermont it is compulsory to wear a helmet. I remember thinking ‘oh god I have to wear a bight red helmet…how embarrassing!’…however, I am now embarrassed to admit that this vanity resulted in me not wearing a helmet between the age of 10 and 18. It will keep your head warm, this might seem like a very pathetic reason but it is true! My head is so much warmer in a helmet than it ever was in a hat (especially in high winds). Equally, my helmet has a ‘vent’ element/accessory meaning if I do get to warm I have the option to cool myself down. On the subject of helmet accessories I should also point out that most helmets have a clip on the back for your goggles, meaning they will always stay perfectly attached rather than move around if not fall off when worn over the top of a hat. You can also find some helmets which are starting to include technology features, such as speakers! So for those that enjoying listing to music while on the slope you can now listen without headphones being poked awkwardly into you ears. 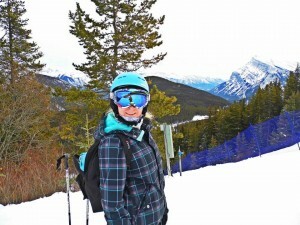 Ski fashion was notorious in the 80s for its electric colours and quirky patterns (and as someone who has a passion for fashion), I am delighted that being fashion conscious on the slopes it still very apparent today with new trends being produced year on year. Helmets play a big role in this with so many top brands producing helmets designed in bright colours, interesting art work and just stylish designs in general. 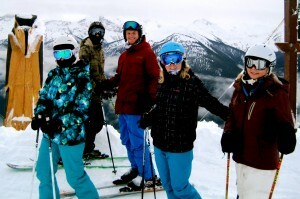 Equally, many ski enthusiasts use their helmet as a time capsule! 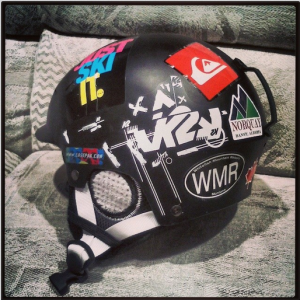 Both my sister and her boyfriend decorate their helmets with stickers produced by their favorite brands and also stickers from the ski resort so they can keep track of all the amazing places they have had a chance to ski. The obvious one…a helmet could save your life or at the very least prevent serious head injures. As stated earlier you could be a confident skier and have great control on the snow but others around you might not and a small collision could end with nasty results. I think helmets should be seen the same as seat-belts in a car or life-jacket when doing water sports…they have been designed to help protect you from serious harm, helmets are there for the same reason. In summary, as someone who never use to wear a helmet I now can’t imagine not wearing one and I have no desire to stop wearing one. I hope that Michael Schumacher makes a full recovery and that his tragic ski accent inspires others to wear a helmet in the future.